Virtual Bass Amp: lighter than a real one. 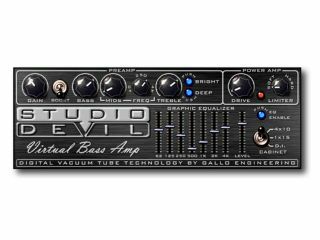 With its Virtual Guitar Amp, Studio Devil managed to produce a high-quality amp emulator at a very reasonable price, and the company is now aiming for similar success with the Virtual Bass Amp. As its name suggests, this is designed for the creation of low-end tones: it features the same tube modelling technology as VGA and its interface is inspired by that of a hardware bass amp. This software is said to be capable of modelling a wide range of bass tones: it features a power amp, limiter, speaker cabinet and graphic equalizer. It promises to be easy to use, runs on Mac and PC and supports the VST, AU, and RTAS plug-in formats. Virtual Bass Amp costs $69. It should be available soon from the Studio Devil website, where you'll also be able to download a demo version.